I’m probably a bit late to the party, but one of my recent discoveries is Clinique BB cream. I don’t like foundations, but this really evens out the skin tone without feeling like I’m wearing a mask. Years ago I used Clinique City Block but it made my skin look a bit pasty in the summer when I got a tan, so I switched to using just a moisturizer with SPF, some concealer and a bit of loose powder to even out and mattify everything. I use BB over my La Roche-Posay moisturizer and it blends really well with my skin tone. It doesn’t feel like make-up at all and it has SPF! Perfect. Another new favourite is Clinique Chubby Stick. I’ve been searching for a good berry tinted lip balm for a while now and a friend recommended this fun looking product that immediated appealed to me. I love a dramatic lipcolour, especially in winter, but usually I have other things on my mind and don’t feel like making a lot of effort. This is quick and virtually fool-proof. The colour (nr. 16) looks pretty dramatic but it goes on sheer with just the right amount of shine. Burt’s Bees lip shimmers are another personal favourite. I buy these in bulk so there are always some in the bag and make-up cabinet. I rarely use eye pencil, because I realized it tends to look harsh on me, even when blended properly. 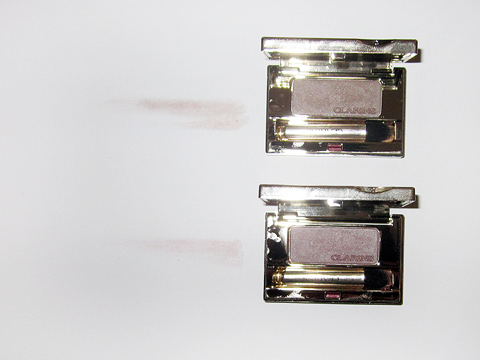 These Mineral eyeshadows by Clarins are great for days when I want a bit more polish. I use no. 8 (taupe) to add a bit more depth to the crease and outer corner of the eye, as well as underneath the bottom lashes. No. 9 (lavender tea) is interesting because it’s a very subtle violet taupe. I was initially hesitant, but the handful of times that I’ve had my make-up done professionally, I learned that violet tones such as these compliment my eye colour (grey). Another Clinique product! Like Mink (I really enjoy this name) is a bit more dramatic brown and usually reserved for the evening. The lighter pigment on the left also matches really well with the Clarins colours above, when used in the inner corner of the eye to brighten up. This entry was posted in Items and tagged BB cream, burt's bees, clarins, clinique, Into The Gloss, make-up. Bookmark the permalink. another lovely post! would it be possible to ask what the colour name is of your chubby stick? i can’t find the no 16! it looks a beautiful colour. many thanks …. No. 16 is also called Voluptuous Violet. thanks for replying – have a good week!